As mentioned in an earlier blog post , a solder paste's alloy type, powder particle size distribution (PSD), and metal loading (weight of metal as a percent or "%w/w") affect the rheology, and hence the performance in use, of the solder paste. Three IPC test methods are used to guarantee that customers are receiving consistent product (within agreed tolerances). In this post, the one test that that we will be focusing on is the %w/w metal loading test, which has not changed in decades and almost always gives the wrong answer. That's a pretty strong statement to make, so I'll be showing you the evidence in this short series of blog posts - and presenting a proposal for improvement. Note that the %w/w metal loading test is the only one that evaluates the finished good. The alloy conformance and PSD are determined for the powder, prior to paste blending. Let's start with the "wrong answer" part, as that will be the most contentious. The essence of the standard %w/w test method, (IPC-TM-650 2.2.20 "Solder Paste Metal Content by Weight") is that a weighed 50gram sample of solder paste is reflowed, washed of flux residues, dried, and the final single button of reflowed solder is weighed to allow the calculation of the weight of solder metal present in the original solder paste. So why is that wrong? Because the answer is almost always lower than expected, and often much less than a more precisely controllable quantity we can call the "Manufacturing Target Percent Metal" (MTPM). We'll talk about the MPTM in a minute, but just note for now the current J-STD-005A (Table of Contents here) section 3.4 (Metal Percent) allows "+/- 1.0% of the nominal value specified on the user's purchase order", which is sufficiently broad a range to potentially cause a solder paste to vary widely in usage: for example, from slumping (-1%) to short stencil life (+1%) for a printing paste. 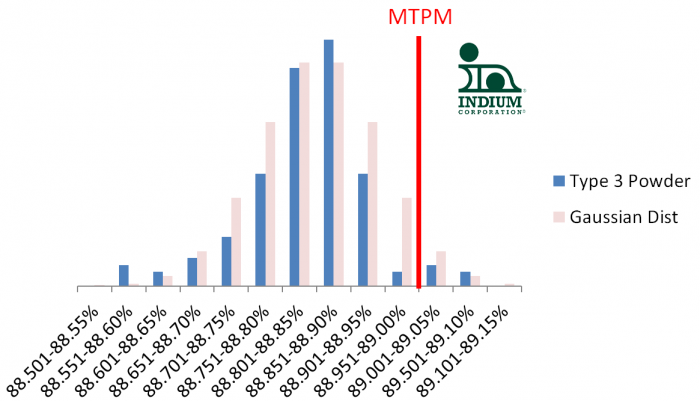 The MTPM is extremely well-characterized as it is used to blend solder paste for customer orders, using calibrated weighing equipment capable of precision far beyond two figures of decimals (better than 0.01%) in most cases. In practise, manufacturing controls are in place easily allowing a much better than +/-0.10% reproducibility of metal loading from batch to batch, and this weighing data is documented in the associated batch data along with other critical details. For this reason, the MTPM from a reputable solder paste manufacturer is the %w/w solder paste metal loading stated on the product label and in associated quality documentation, and is taken as identical to the "nominal value" referred to earlier. So what results do we get when we do the IPC metal loading test on a standard solder paste? The data for a standard, long running Pb-free solder paste was collated to show you what happens. Firstly, since we will be talking about population distributions in terms of standard deviations, the inherent assumption is that the data is normally distributed, but the assumption needs to be tested. Even with the limited dataset available (121 data points) there is some evidence that, although the data is symmetrically distributed about a mean value, it does not fit the standard Gaussian distribution well; possibly being a superposition of two distributions on almost the same mean. However, we can make a first order assumption that the data fits a standard bell curve for discussion purposes. The consistently-lower mean weight losses for the water-soluble pastes will be discussed in the next blog post. The +/- 1% IPC standard allowed tolerance means even with a 3-Sigma definition of the allowable tolerance, the test will pass. The fact that results are consistently on the low side is obscured by the huge width of the %w/w tolerance. In summary, taking the IPC TM-650 2.2.20 test result as a definitive measure of metal loading is therefore rather like using a sun-dial with its gnomon oriented in the wrong direction to tell the time - instead of a smart watch. It's only useful if you forgot to charge your watch. More on the reasons for the consistently-low metal loading results, flux effects, and the effects of particle size in my next post.